Professor Unandar Budimulja passed away peacefully on Tuesday, April 2, 2013 at 10.35 pm. He had dedicated himself selflessly to the development of dermatology in Indonesia and the region. 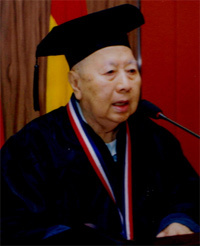 His efforts as a founder council member of the League of Asean Dermatological Societies resulted in the signing of the Bali Declaration of LADS in 1984.As the Founder President, his support and guidance was instrumental in the formation of the Asian Academy of Dermatology and Venereology in 2009. His involvement and love for teaching spanned many decades since 1962 and he was the Professor of Dermato-Venereology, University of Indonesia since 1991.He was a great leader in clinical dermatology and was a constant figure in all the Region Conferences of Dermatology (Asian-Australasian) since its inception in 1974. His passion for medical mycology as the Founder and Chairman of Indonesian Medical & Animal Mycology Organization was truly legendary. He continued to serve as the Advisor of the Indonesian Medical Human & Animal Mycology Organization since 1996 and Chairman of the Study Group of Dermatomycosis Indonesia Perdoski. Professor Unandar was steadfast in the advocacy of high standards in postgraduate dermatologic training in his capacity as the Promoter, Examiner and Assessor of the Faculty of Medicine, University of Indonesia and several other universities in Indonesia since 1986. He served on the Editorial Board of Media Dermato-Venereology Indonesia and the International Editorial Advisory Board of the Asian Dermatological News and the Indian Journal of Dermatology. He was the Peer Reviewer of the Indonesian Journal of Pharmacology and Therapeutics. In his passing, our dermatology fraternities in Asia have lost an illustrious figure and a friend. He leaves behind a beloved wife and three children and three grandchildren.